What are the tools used today by a yacht designer? Let's quickly go over what was done in the past, this is necessary to understand how much we progressed in the last 30 years. Not so long ago, boats were not designed. Builders started with molds that they modified, spaced differently, guessed displacement and hoped that the boat would float right. Some created half hull models and took lines from them. 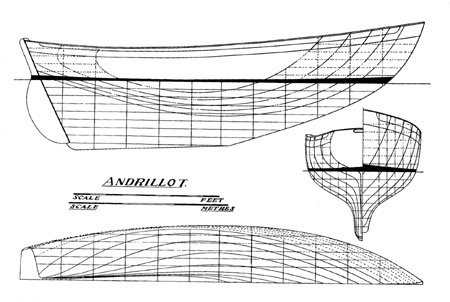 Around 100 years ago, some yacht designers began to really design boats, on paper. This had been done since the 16th century for large ships but not for yachts. The hull was represented in 2D in 3 views, a side view, a top view and one from the front. Those views took the name of the sections that they represented: buttocks or profile, waterlines and stations. We still use those terms. the cut on the tip of a pen, not very accurate. In the boat building yard, the lines were enlarged. The complete lines plan was redrawn on the floor to full size. That was usually done in the loft, hence the word lofting. Paper drawings could not be accurate: the thickness of a pencil line became several inches when enlarged and for that reasons, discrepancies appeared between the three views. It was the responsiblity of the lofter to correct the lines plan and not two boats ever came out exactly the same. Lofting was an art, difficult and time consuming. The switch to computer assisted design is recent. In my engineering and architectural classes, I used paper and pen for drawing and a slide rule or tables for calculations. In the 60's, when I took my first yacht design class, we still used the same methods. Not much later, the first programable calculators came out and we could begin to use mathematical curves definitions then math surface definitions. A boat designed that way did not need lofting. Any point on a surface could be calculated but it was tedious and we still had to draw the 3 views on paper to visualize the hull. The calculator and later, the first computers, were a great help for other tasks. There is a lot of math involved in the design of a boat. From the hydrostatic calculations to the weights, all became much faster with spreadsheets. Our work also became much more precise. 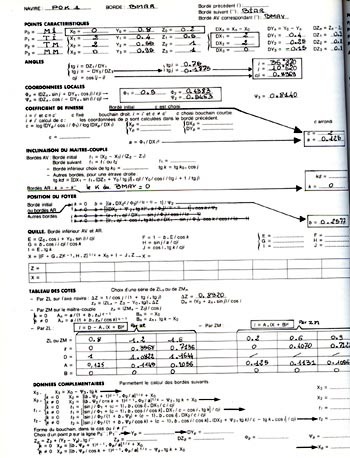 In 1967, Cyril Grandpierre, a French designer, published a unique book about mathematical deifinitions of hull surfaces but it was too early for graphical displays on computer and anyway, the computing power wasn't there. It was ignored by most. The real revolution started in the early 80's. David Vacanti presented a remarkable paper to the SNAME about the use of a computer program to design hulls. He was not taken seriously except by a few who bought his first program. I was one of them and started to use Prolines. At that time, all CAD for the PC was 2D. I used AutoCad instead of pen and paper since a few years. The drafting was done the same way than on paper but with much greater precision. Prolines was different. It was real 3D program. You worked with a real surface, not with 2D lines. In Prolines, the surface is defined by a net of control points that pulls the surface. This method is still the one used today and called a NURBS surface. Since the surface is defined mathematically, all the calculations can be done by the computer and again, are much more precise. The old methods were approximations based on 2D sections and measurements taken from a scaled drawing. Prolines was not the only 3D hull modeler, many others, some quite good appeared around that time. It took a while for the yacht design community to embrace the new way of designing boats. More exactly, there was a strong prejudice expressed by those who were stuck in their ways and reluctant to learn new methods. In the early 90's, more than 10 years later, the Westlawn Yacht Design Institute began to accept CAD work and today, almost nobody drafts with paper and pen. I worked with collegues on particular points like developable hull panels. I had a LISP routine in ACAD, Cliff Estes had a better one in his ACAD add-on Baseline but when some developers came out with sophisticated development tools, I switched to Nautilus. Nautilus, the old version of ProSurf. One of the ACAD add-ons with which I worked as a beta tester was Rhino. 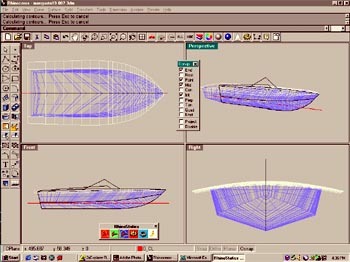 Rhino matured to a 3D stand-alone 3D modeler and became the modeler of choice for yacht design. The previous pages, written in 2002, show views of Rhino with the Cliff Estes hydrostatics add-on. We will cover the exact software used today in the next article but keep in mind the differences between designing on paper or on the computer. We draw surfaces, not lines. This eliminates the innacuracies resulting from working in 3 views. We work with a 6 decimal precision instead of a precision of several inches. Lofting is eliminated since the boat is designed full scale. We work fast with powerful analysis tools. This means that we can try many variations on a design until we obtain the exact result we want: better boats. We truly build the boat in 3D: no interference problems anymore. There is no excuse to keep using old innacurate methods or to buy plans that require lofting. Coming next: what we use: 3D modeler, 2D drafting, visualization tools and specialized spreadsheets.